sehr gut, vor allem "California" und "Calling all angels"
Quite good, but I'm not totally satisfied as a real Lenny-fan. Maybe it has to do with 3 songs: Calling all angels, What did I do and The Otherside has the same feeling, the same drum beat. 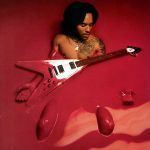 And the melodies are quite simple and known, but fortunately there are some highlights: such as Lady and Where are we runnin' (one of my all time favourite Lenny tracks). And there are some good solos (guitar and sax). So lt's no waste of time listen to Baptism! Singles: Where are we runnin (#5 Holland), California (#17 Holland), Storm (released as Just Blaze remix), Lady (download radio edit), Calling all angels (#33 Holland), ? Also die ersten paar Songs kann man komplett rauchen, nachher wird es glücklicherweise besser.<br>Hätte ich mir sparen können! In vergelijking met zijn andere albums vind ik dit toch een wat minder album. De singles "Where are we running?" en "California" zijn voor mij de hoogtepunten. Ein Lenny Kravitz Album, das weder auf- noch abfällt.